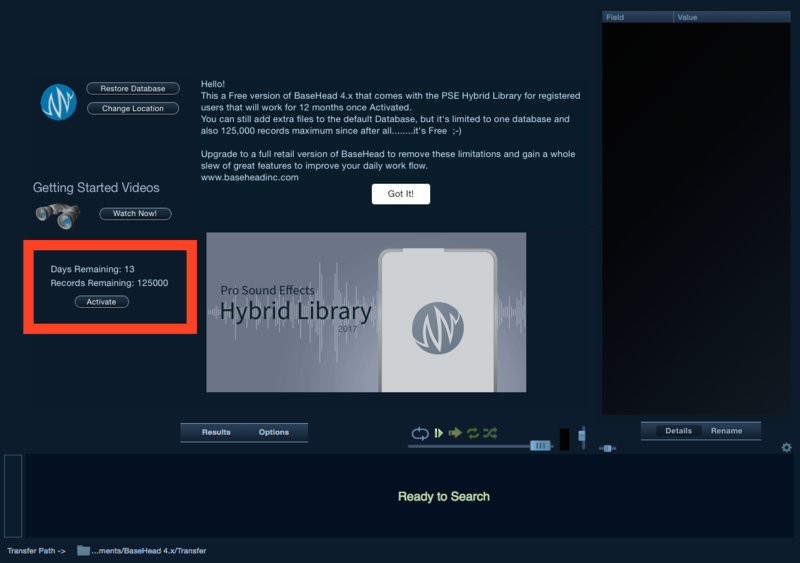 Pro Sound Effects has partnered with BaseHead to include bundled search software as a new 2017 feature of the Hybrid Library at no extra cost! 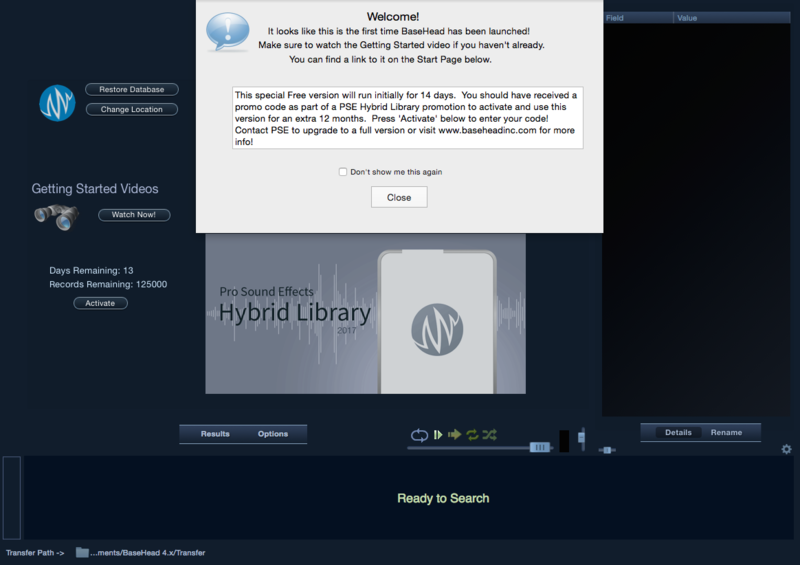 All Hybrid Library Users now have access to a one-year trial of BaseHead 4.x Hybrid Library Edition (Mac and PC). BaseHead 4.x Hybrid Library Edition (HLE) is essentially BaseHead 4.x Lite but limited to one database and 125,000 records. 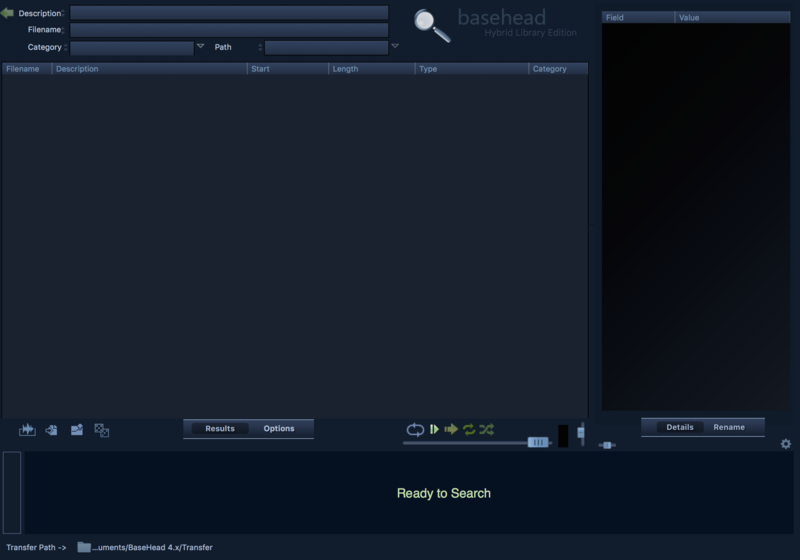 For Hybrid Library users who (a) aren’t already BaseHead users, (b) don’t already have search software incorporated into their workflow, or (c) are curious about alternatives, BaseHead HLE gives you the ability to instantly search the library by keyword and drag-and-drop sounds directly to your DAW. Upgrade paths are available from BaseHead HLE to Standard and Ultra – contact support@baseheadinc.com for more info. You will receive the BaseHead HLE application/program file within the BaseHead – SFX Database folder on your Hybrid Library hard drive or via download. After copying BaseHead HLE to your preferred location and launching it, you will see the Welcome! message. BaseHead HLE will initially run for 14 days until you start your one-year trial using the activation code provided to you by a PSE rep either (a) in the welcome info email following your purchase, or (b) in the Annual Update email. To begin your one-year trial, click the Activate button on the left (before clicking the Got it! button) and enter your code. You may need to make the window larger in order to see the Activate button under the Getting Started Videos section. While activating your trial, or if the location of your Hybrid Library changes, BaseHead may ask you to locate the Hybrid Library root folder. This is simply to ensure that you are indeed a licensed Hybrid Library user. BaseHead HLE comes with a pre-scanned database for the Hybrid Library 2017, so you do not need to create a database. If you click the Got it! button and are taken to a blank Results page – that’s normal 🙂 Simply enter a keyword or two in one of the search fields above and watch the results populate. Be sure to check out the Getting Started info page and video if you haven’t already. Have a previous version of the Hybrid Library? If you have a previous version of the Hybrid Library (purchased before Nov. 22, 2016 / less than 63,000 sounds), then you will need to erase the default database and Import Audio Files to create a new database for your version of the library. Instructions for this are provided in the Annual Update email. 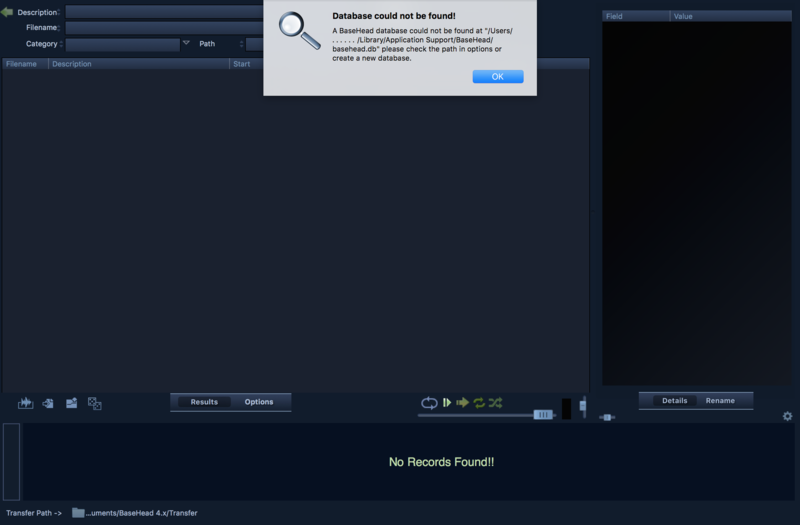 If you get a Database could not be found! error message when trying to Import Audio Files, try clicking the Restore Database button (on Options tab) to reload the default Hybrid Library 2017 database, and then repeat the process one more time. If you want the latest version of the Hybrid Library on hard drive with updated metadata, keep in mind that you can order a Hybrid Library Hard Drive Replacement for the cost of the hard drive ($80 USD) + shipping. Want more features? Upgrade paths are available to the Standard or Ultra version – contact support@baseheadinc.com for more info.